During my parents’ visit to Taiwan I took them to the Formosan Aboriginal Culture Village for this year’s Cherry Blossom Festival [九族櫻花祭]. 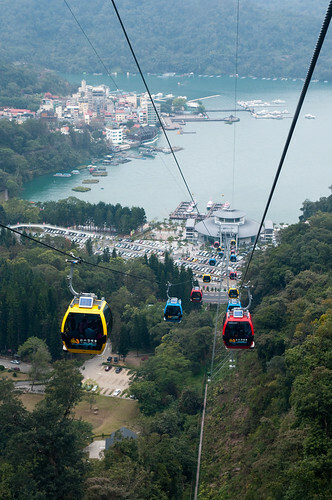 While there, we rode the Sun Moon Lake Ropeway [日月潭纜車] to Sun Moon Lake and back. 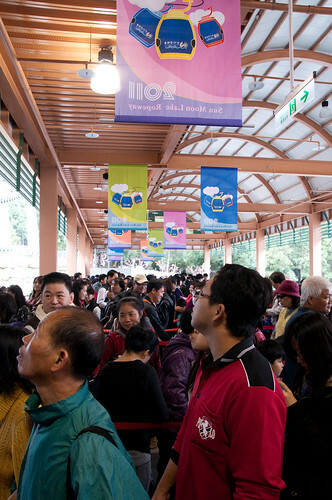 Tickets for the ropeway were included with admission to the Aboriginal Culture Village. 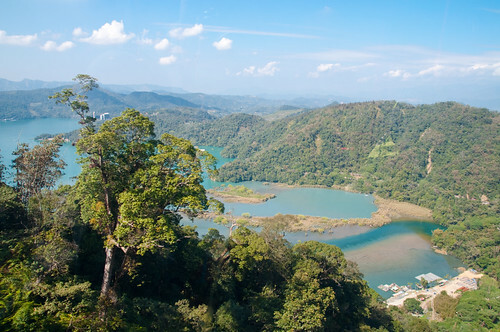 The ropeway is about 1.8 kilometers in length and gives visitors a bird’s-eye perspective of the area’s lovely scenery. I’ve heard of people waiting several hours on weekends to ride the ropeway; luckily, we visited on a weekday and waited roughly a half-an-hour. 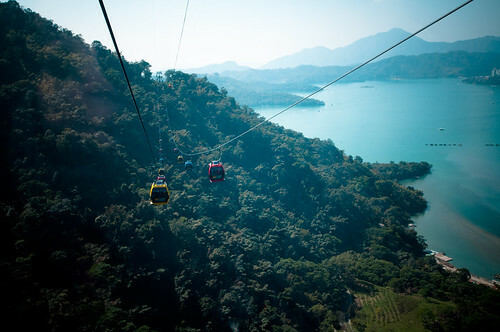 The second ropeway will run from Nantou’s Checheng Station (車埕) to Hsiangshan (向山) and cover a total distance of 4.6 kilometers. 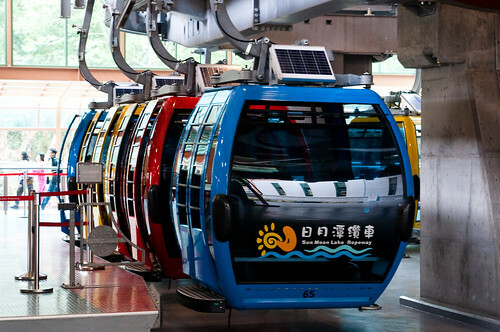 The administration planned to have the ropeway built under the BOT (build-operate-transfer) or OT model, with the government constructing other facilities such as transit stations and parking lots to entice businesses to invest in ropeway construction, said the administration. Hopefully, these two ropeways can operate free of the difficulties that have plagued the Maokong Gondola since its opening. 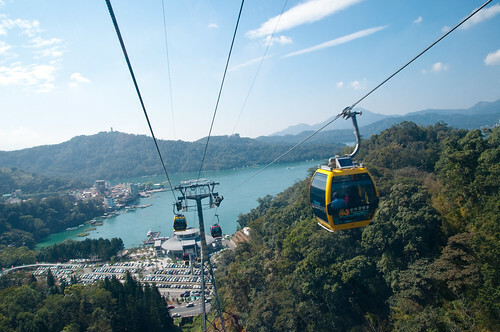 The last time I visited the Sun Moon Lake, there was not a ropeway yet, so this article is fresh to me. You mentioned that you visited 九族櫻花祭, so I think you may be interested in visiting the Southern Cross-Island Highway. If you are interested, choose a day with a nice weather (so that there will be no frost on the road). Also, check if the road’s condition is good. There should be mountains of cherry blossoms and peach blossoms, making the mountains pink. For Sun Moon Lake, you can try some small roads uphill, and you may find something surprising (still remember that safety is the priority). Thank you for blogging. I enjoy your travel, too! Unfortunately, I haven’t done any exploration along the Southern Cross-Island Highway. Perhaps my wife and I can take our daughter along it when she’s older. I’ve been to Sun Moon Lake yesterday for the first time and it was really beautiful. But I didn’t take the ropeway, I’m gonna do that next time I visit. Thanks for the information. Happy to hear you enjoyed your trip! 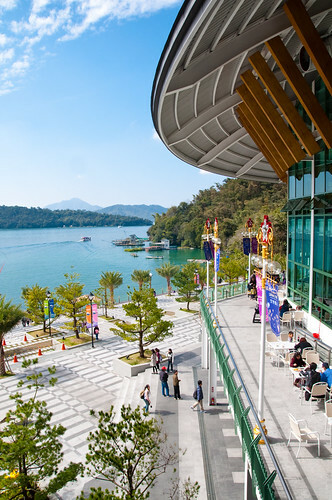 A lot of foreigners who have been here for a while seem to really dislike Sun Moon Lake. I’ve been there a few times now and have enjoyed every visit. If you are going to take the ropeway, try to head out on a weekday to avoid the lines. I’ve only been to Sun Moon Lake once, but it was very calming and a fun trip. This ropeway is news to me so I’ll have to check it out next time. Definitely worth a visit. Enjoy your trip! 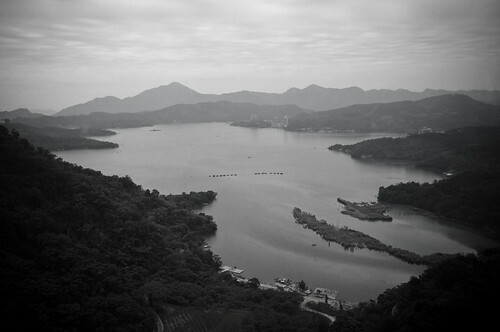 I also haven’t taken the ropeway, but Sun Moon Lake is one of the best tourist destinations in Taiwan in my opinion. If you can get up early enough to catch the sunrise, it’s worth it. I haven’t had a chance to see a sunrise at Sun Moon Lake, yet. I’ve heard it’s wonderful, though. I have a few paid vacation days accumulated that I need to use up before August – spending the night at Sun Moon Lake with my family isn’t a bad idea. Beautiful photos! At least they have gondolas that work! They look so modern. Big difference from my last trip there (around four years ago).